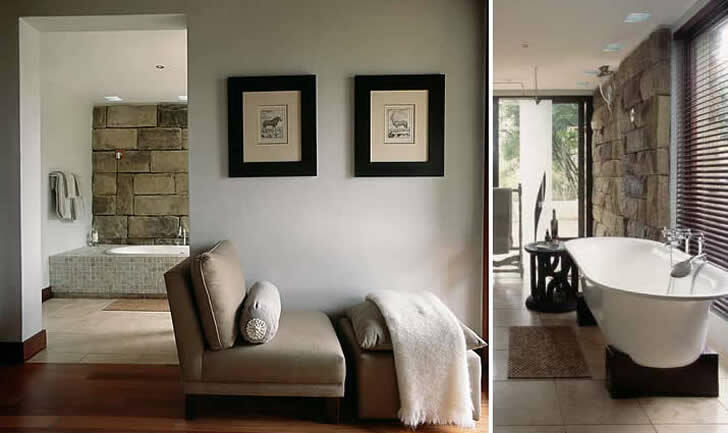 The choice of sandstone as the main material, in combination with thesubtlety of the colour palette and careful management of pattern, texture and detailing, allows Phinda Getty House to strike a well-balanced dialogue with its environment. Phinda Getty House sits unobtrusively in its tranquil setting, ringed by gently rolling hills and overlooking an extinct volcano now covered in lush vegetation. 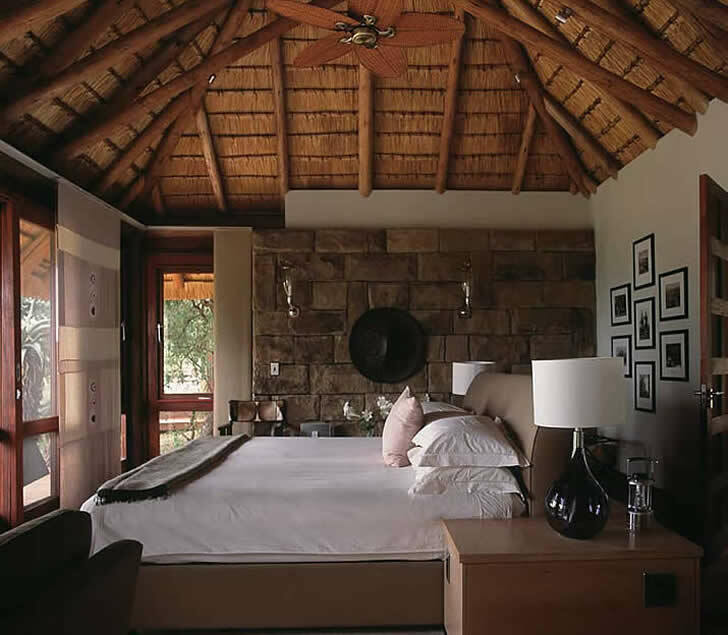 The lodge is situated in the southwestern region of the KwaZulu-Natal in northern KwaZulu-Natal. At 22 000 hectares, Phinda is one of southern Africa�s largest conservation areas and features no less than seven distinct wildlife habitats, including a sand forest abundant with exotic treegrowing orchids, open savannah dominated by otherworldly acacia trees and an evergreen forest made lush with tamboti, sycamore fig and weeping boerbean trees. 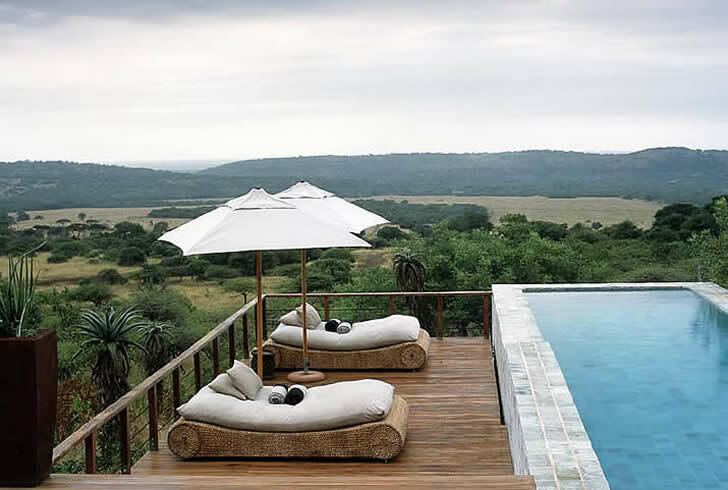 Unique to the portfolio of Conservation Corporation Africa�s lodges, Phinda Getty House is intended as a sole-use villa for families or groups when its owners � as the name suggests, members of the famed Getty dynasty � are not in residence. Despite the supremely luxurious credentials and sophisticated atmosphere of Phinda Getty House, both its architect and interior designer � Nick Plewman and Conservation Corporation Africa�s creative director Chris Browne, respectively � have demonstrated a restraint that intentionally plays down the owners� illustrious provenance and instead invites guests to play home from home while also taking in the spectacular beauty of the natural environment. 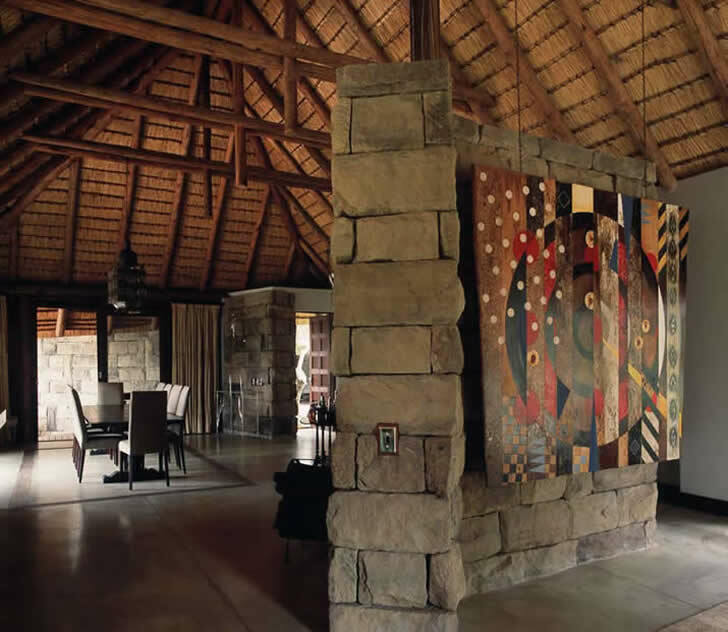 That the building�s vernacular is reminiscent of a classically South African farmhouse (with its thick stone walls and thatched roof) is no mere architectural conceit � the massive sandstone blocks that constitute the spine of the structure are in fact reclaimed materials from an old rural barn that were transported to the site. For architect Plewman, the choice of these building materials was an act of appreciation for both the location�s and the owners� unspoilt character. �The walls of old sandstone anchor the structure in time as well as place,� he explains. A linear layout was chosen to allow the homestead to snugly recline into the contours of its broadly sloped, hilly site. This arrangement of the public spaces and four private suites also acts to orient every room towards the spectacular views outside, the experience of taking in the vistas further facilitated by a fa�ade largely comprised of floor-to-ceiling glass walls. Unstained wooden decking outdoors and light grey screed floors inside complement the simplicity of the sandstone, demonstrating the architect�s preference for reducing unnecessary detail or visual distraction. An interior configuration of free-flowing spaces on different levels emphasises the design team�s intention of creating a place suited to relaxed, low-key family living. �The interior style of Phinda Getty,� affirms Chris Browne, �is that of cool, modern Africa.� While the handcrafted leather chandeliers, custom-designed rugs, decorative fabric window panels and other statement pieces by South African textile artist Jenny Gifford provide a pleasantly flamboyant surprise, the underlying design ethos is low-key and unpretentious. The villa rate here includes your own game ranger, 4x4 excursions, butler and chef, ensuring that your every request is indulged. 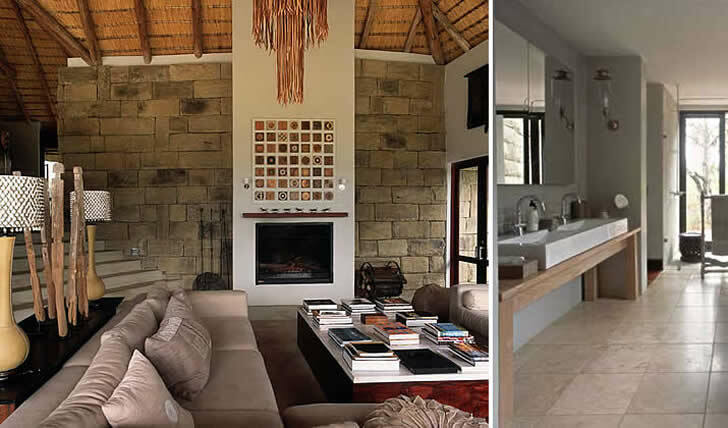 The point that will be emphasised most during your stay at Phinda Getty House, however, is to make yourself at home.